Bifido Factor protects the walls of the large intestine from colonization by harmful bacteria and yeast, Bifidobacterium bifidum, Malyoth super strain is the most potent beneficial bacteria available. 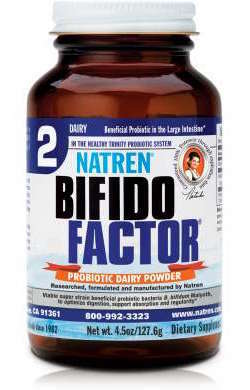 Natren's Bifido Factor supplies 2 billion colony forming units (cfu) of Bifidobacterium bifidum, Malyoth super strain per serving. Bifido Factor is available as a dairy free powder.